Copyright © 2017, 2018 by Roland Stull. Available to use and share for free under a Creative Commons License. (Click on chapter links below to get pdfs of individual chapters. 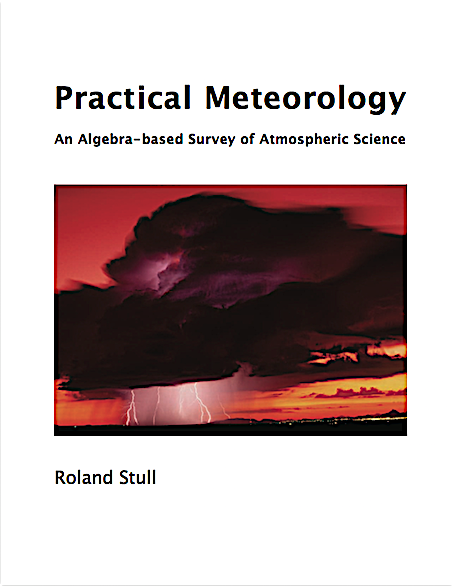 Stull, R., 2017: "Practical Meteorology: An Algebra-based Survey of Atmospheric Science" -version 1.02b. Univ. of British Columbia. 940 pages. isbn 978-0-88865-283-6 . Get a free pdf copy of the whole book here (82 MB), or free pdfs of individual chapters below. To purchase a printed copy, click here to see options. I have already visited his site a few weeks back and have made the decision to adopt this text for my intro to met class. Having looked through it, I can say that the book is very well-rounded, richly and professionally illustrated, with some great supplementary (boxed) material for deeper dives. Roland is a wonderful writer, with exceptionally clear expositions. Props to Roland for making available this resource, in a time when text prices are escalating, and so many of them do not provide any quantitative degree of rigor. It's a text AND an exercise manual rolled up into one! • See More Testimonials about the Practical Meteorology (PrMet) book. • See a 3-slide presentation for pros and cons of an algebra-based university curriculum. 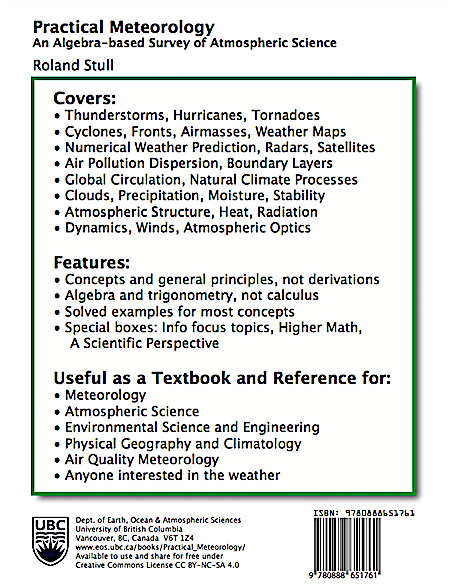 • Access Older versions of the book, including the 2011 book under its old title "Meteorology for Scientists and Engineers, 3rd Edition". • See Tips for students, TAs, and instructors . • Some universities are creating online resources to accompany PrMet chapters. More info soon. • See an interview with the author about this book. Attribution — You must give appropriate credit to Roland Stull, provide a link to the license, and indicate if changes were made. You may do so in any reasonable manner, but not in any way that suggests that Stull endorses you or your use. ShareAlike — If you translate into another language, remix, transform, or build upon the material, you must distribute your contributions under the same license as the original. See exclusions on the back of the title page.